Mitchel Brown is a distance runner in Victoria, who’s performance over recent years has seen him become one of our great distance athletes. Well he continues to improve his running, he also manages popular running magazine ‘Run For Your Life‘, and has agreed to answer some questions for Athletics Exclusive. Lachlan – First questions easy, how did you get involved in athletics? Mitchel Brown – Back when I was in about Grade 1 at primary school, we had the propaganda mongers from Little Athletics come in to tell us how great athletics was and that we should all sign up immediately. I was obviously very impressionable because I didn’t take much convincing. I went home, begged my parents to sign up and I reckon I was down competing by the next week. Funnily enough, I only found out years later that my dad hadn’t actually been all that keen for me to do Little As. He was (and still is, in fact) pretty heavily involved in athletics himself and had also done Littles as a kid, but he didn’t really have great memories of it and was worried that it might turn me off the sport. He realised pretty quickly, though, that things had improved a lot since his time, and before too long he was in there raking the long jump pits every week. Lachlan – Currently, what does a weekly program look like for you? After a good period of this type of work, I will start to incorporate some threshold-paced work before moving into more specific track work (i.e. reps at 5000m and 10,000m pace). It’s a training plan that essentially blends together a lot of the philosophies of coaches such as Arthur Lydiard and Jack Daniels, and yet it’s one that not too many others that I know seem to be doing. It can be a little bit daunting to think you’re the only person training the way you are, but it’s a pretty nice feeling when things are going well and you’re identifying the progress, as it gives you the confidence that you have the upper hand on your rivals. Mitchel Brown – The first point would be to be patient. I’m now doing training weeks of 160-170km, but that didn’t happen overnight. It was a very gradual build-up over a long period of time, and it’s vital that the process of increasing your training volume happens over months and years, not days and weeks. It’s also important to realise that the same training volume (particularly with aerobic work) can continue to yield returns over many years, and that you therefore shouldn’t get too hung up on doing more and more every year. The second thing I would say is to not let your running consume your entire life. I remember reading some very wise words from Tim Noakes in Lore of Running that basically said unless you are a World Champion, you can’t afford to get to the point where you are regularly casting aside family functions and social engagements for the sake of your training. People simply won’t understand or accept it, and nor should they have to. What’s more, if you get to the point where your running isn’t going as well as it should be, or you are forced to take time off due to illness or injury, it’s important to have something else in your life for the sake of your own mental wellbeing. I have definitely been guilty of placing too much importance on my running at times; but even though I have now made certain lifestyle choices to help accommodate my running, I like to think that I strike the balance right by affording plenty of time for friends, family and other activities and interests. Lachlan – I remember reading a journal post you wrote about how you changed your mindset for athletics. The piece was titled “How I Learned to Stop Worrying and Love the Run”, which made me really think about my own approach to athletics. For those who didn’t see the article, could you explain what you meant by that heading? Mitchel Brown – Ha! Sorry, but it’s hard not to laugh at this one. I guess I underestimated the significance that might be placed on that title. The whole piece was actually called Col. Birmingham or: How I Learned to Stop Worrying and Love the Run. Col. Birmingham was obviously referring to Collis Birmingham, who was largely the subject of the article and who goes by the nickname “Colonel”. But the title as a whole was a reference to the Stanley Kubrick film Dr. Strangelove or: How I Learned to Stop Worrying and Love the Bomb. I like to trick people into thinking I’m more cultured and sophisticated than what I actually am by including obscure film references and literary quotes in my articles. In all seriousness, though, the piece was a fairly philosophical take on my 2012 season. 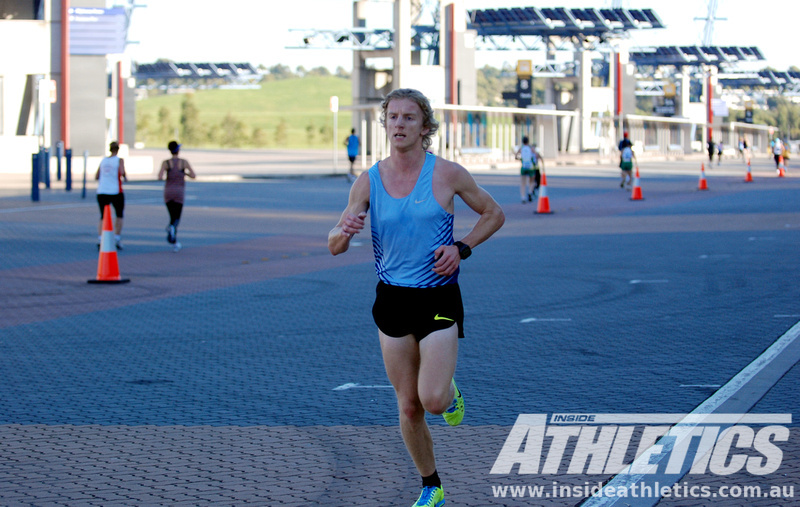 I had definitely gotten ahead of myself based on my successes, to the point where I probably thought I was better than what I actually was, so it was a bit of a reality check to get well and truly put back in my place at the Burnie Ten by some genuine world-class athletes. At the same time, it was also an experience that made me take stock of my situation and the progress I had made, and the fact I had come so far in such a short space of time. What started as a fairly negative experience therefore ended up becoming a really positive motivational tool going forward. Lachlan – For those who are unaware, Mitchel is the Editor of popular running magazine ‘Run 4 Your Life’. How have you managed to continue to excel as a distance runner while taking on such an crucial role at the magazine? Mitchel Brown – I’ve been really lucky in this sense. The role allows me to work from home, and as much as that can lead to the feeling of being a prisoner in your own house at times, it has also given me incredible flexibility for accommodating my training. While there are very busy work periods, it generally also averages out to being part-time hours, so that certainly helps a lot as well. Being part of Nike’s Bowerman Athletic Club program has also been a huge help, particularly now that I don’t make quite as much money as I did when working full time. While running is a comparatively cheap sport, all those pairs of singlets, shorts and especially shoes add up to a fair bit over a period of time. Being able to receive this gear from Nike has therefore been of massive assistance, and their efforts to accommodate me with footwear specifically suited to my needs and to respond to feedback on their products have been outstanding. Lachlan – With the new year fast approaching, what is your main focus for 2014? Mitchel Brown – I’ve never made an Australian track and field team, so the Commonwealth Games in Glasgow is obviously on my radar. With the easier qualifying standards, I’m hoping I might be able to make the cut over either 5000m or 10,000m to get a taste of international championship experience and give myself every chance of making the team for the 2015 World Champs and/or 2016 Olympics. On paper, I’m not too far off the current 10,000m standard, so I’d like to think it’s possible, but you just never know. I’ve always said that my main reason for putting in the work that I do is that I love the sport, and that if I never made a team for anything I’d have no regrets. It’s a philosophy I plan on sticking by – I just hope I won’t have to worry about it!